The integrated optical trap allows independent manipulation of trapped microbeads as shown in this view of two microbeads trapped by two different dual-beam traps. Image courtesy of H. Schmidt. A new type of optical particle trap can be used to manipulate bacteria, viruses and other particles on a chip as part of an integrated optofluidic platform. The optical trap is the latest innovation from researchers at the Jack Baskin School of Engineering at the University of California, Santa Cruz, who are developing new sensor technology for biomedical analysis and other applications. "Ultimately, it could have applications for rapid detection of bacteria and viruses in hospitals, for cell sorting in research labs, and for process monitoring in chemical engineering," said Holger Schmidt, professor of electrical engineering and director of the W. M. Keck Center for Nanoscale Optofluidics at UCSC. The new technique offers the potential to create a smaller, cheaper version of the sophisticated equipment used to perform fluorescence-activated cell sorting (FACS), Schmidt said. Schmidt's group has received a $400,000 grant from the National Institutes of Health to explore particle trapping and sorting and other applications of the optofluidics platform. 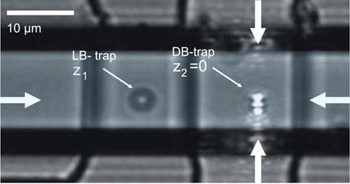 An article describing the optical trap for on-chip particle analysis has been published online by the journal Lab on a Chip. First author Sergei Kuhn was a postdoctoral researcher in Schmidt's lab and is now at the Max-Born Institute in Berlin. Coauthors include David Deamer and Philip Measor at UCSC and E. J. Lunt, B. S. Phillips, and A. R. Hawkins of Brigham Young University, where the optofluidic chips are fabricated. The Jack Baskin School of Engineering at UCSC prepares technologists--and sponsors technology--for our changing world. Founded in 1997, Baskin Engineering trains students in six future-focused areas of engineering: biotechnology/information technology/nanotechnology; information and communication infrastructure; mathematical and statistical modeling; software and services engineering; system design; and bioengineering. Baskin Engineering faculty conduct industry-leading research that is improving the way the world does business, treats the environment, and nurtures humanity.